We’ve gathered here the best exercises for each muscle group so you can get lean and fit more easy. With over 600 muscles in our body, it is easy to forget some important muscle groups when we get stuck in our fitness routine. To help you keep every muscle group healthy and mobile, here are the best exercises targeting each muscle group. Exercise 1: Dumbbell Front Raises. Exercise 1: Barbell Bench Press. Exercise 2: Flat Bench Dumbbell Fly. Exercise 3: Overhead Dumbbell Extension. Exercise 2: Towel Pull Up. Exercise 1: Spiderman Plank Crunch. Exercise 3: Medicine Ball V-Up. Exercise 2: Bent-Over Lateral Raises. Exercise 2: Seated Cable Row. Exercise 2: Weighted Glute Bridge. Exercise 1: Lying Leg Curls. Exercise 1: Standing Calf Raises. Legs on Monday (Quadriceps, Hamstrings, Tibialis and Calves). Middle Section on Tuesday (Glutes, Side Abs, Upper and Lower Abs, Lower and Middle Back). Top Section on Wednesday (Arms, Shoulders, Chest, Upper Back, Infraspinatus). This is an example, but you can plan your own workout using the best exercises for each body part. 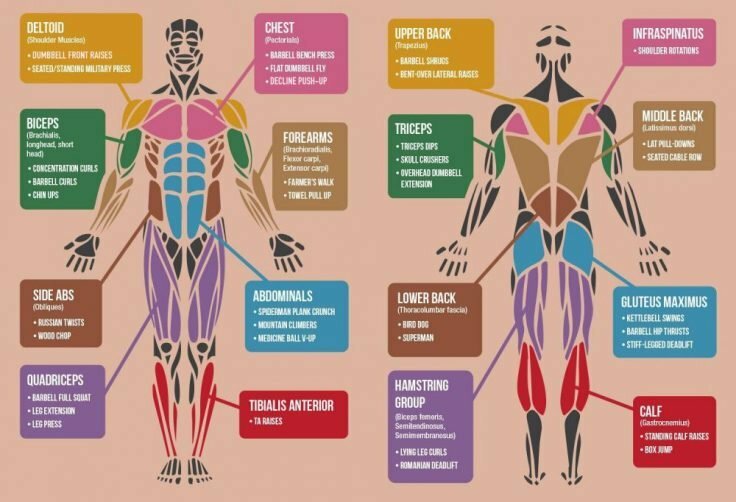 You can check the infographic below for a visual information of the human body muscle groups. FACT 1 – There are about 640 muscles in the human body, and none of them can push. All the muscles can only pull, even when the arm “push” is due to the muscles in the back of the arm pulling the elbow. FACT 2 – Pound per pound, the strongest muscle in the human body is the one we chew with, the Masseters. I really like how you have all the muscles charted out, super cool to see what exercises do what. Why would a decline push up be better than an incline bench press? Or is incline bench press included in “Barbell bench press”?